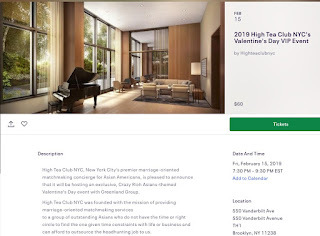 Well, if the developers of 550 Vanderbilt can't yet sell their 3-bed, 3.5-bath maisonette, Townhouse 1, listed for $4.5 million (down from $4.65 million, not to mention the potential 20% flex in the sales price), it can always host a party on Friday, Feb. 15, the day after Valentine's Day. 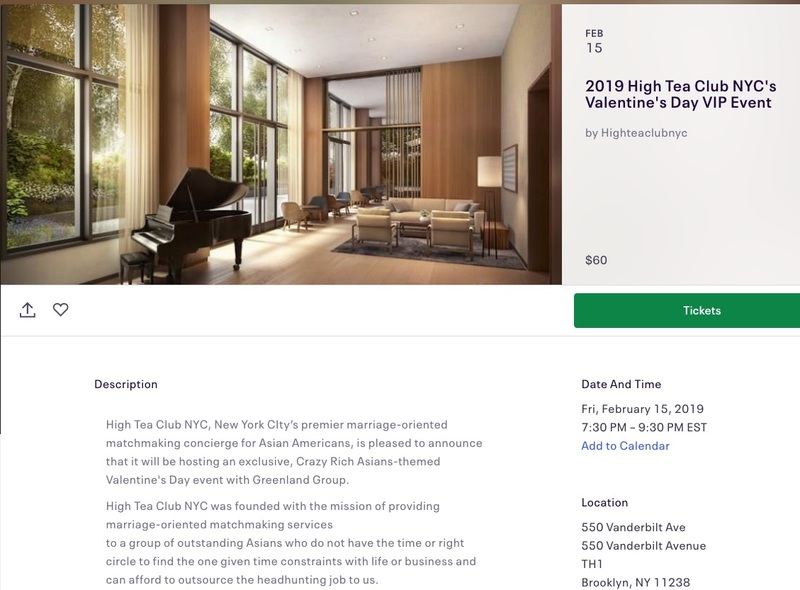 "High Tea Club NYC, New York City’s premier marriage-oriented matchmaking concierge for Asian Americans, is pleased to announce that it will be hosting an exclusive, Crazy Rich Asians-themed Valentine's Day event with Greenland Group." The High Tea Club calls itself "Dating for the 1%." Presumably it's not a complete coincidence that Greenland Group is based in Shanghai, with its subsidiary Greenland USA, the majority owner of Atlantic Yards/Pacific Park. 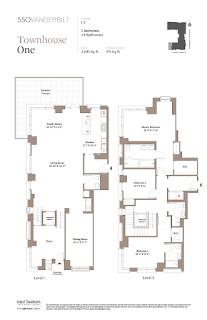 It's a pretty spacious place, some 3,200 square feet over two levels. The entrance is on Dean Street west of Vanderbilt Avenue. 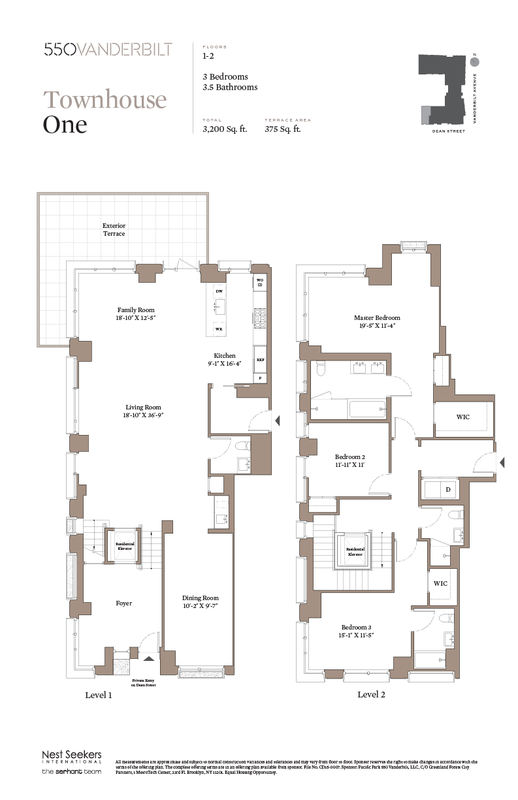 The common charges are $3,717 per month, but real estate taxes are a paltry $247 thanks to the dubious maneuver that lowered 421-a taxes by connecting 550 Vanderbilt to the affordable 535 Carlton down the block. The Residential Units may only be used for residential purposes, and subject to compliance with the By-Laws, for a lawful home occupation. Except with respect to Unsold Residential Units, the Residential Units may be leased by the Unit Owners thereof to tenants only for periods of one year or longer, as provided in the By-Laws. Unsold Residential Units may be leased by Sponsor, its designee or by an Owner of Unsold Residential Units for any period of time, for any use and on any terms which are consistent with the then-existing Certificate of Occupancy for the Building. Sponsor and its designee(s) shall have the right, until the 15th anniversary of the First Closing (or until no Unsold Residential Units remain, if earlier), to use, without charge, portions of the Building, including the Common Elements, for exhibitions, events and/or promotional functions in connection with the sale and leasing of Unsold Residential Units. Such activities will result in excess traffic and noise in the Building, and may interfere with owner-occupants' enjoyment of the Building.